At present, Egypt with its 80 million, and Greece with its 11 million inhabitants, have about the same annual gross domestic product (GDP), ie, around 235 Billion Euros. While Greece is struggling in a perplexed state, in order not to collapse financially, because it followed no strategy whatsoever, as it deals strictly with measures, Egypt took care of matters early on, and through a planned research, managed to discover, thanks to an Italian company, a huge treasure, namely, the hypergigantic Zohr reserve, which solves both its economic and its energean problems. While under the present circumstances, Greece's "competent ones" would've explained to us, that this is an unacceptable move and an agreement deriving through compromise, due to ideological dogmatism. 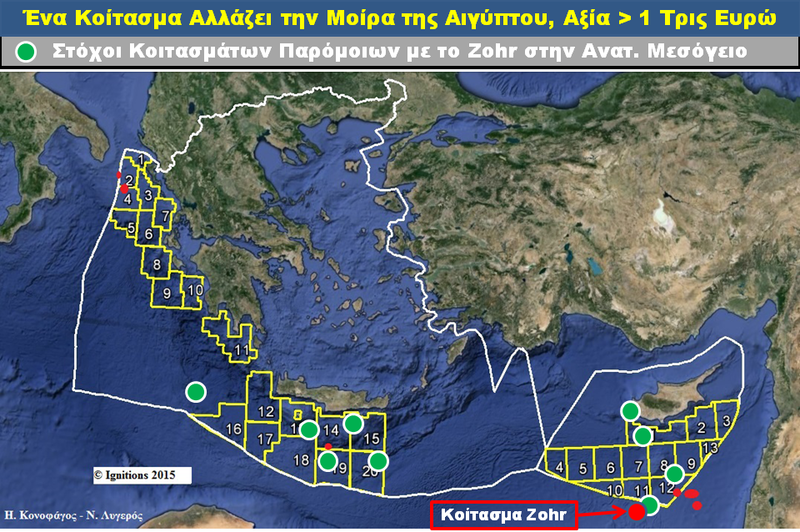 We should note, that the ENI Company, who actually discovered the reserve, close to the point of contact of the Egyptian EEZ with the Cypriot one, already stated proven reserves, (Proven Reserves, 90% probability) of approximately 30 trillion cubic feet, while the Egyptian state company E-GAS reported probable reserves (Probable Reserves, 50% probability) of ~ 60 Tris cubic feet, a figure which we took into account through our economic calculations. 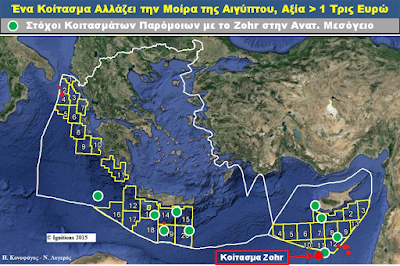 We also know that Greece inports its gas from thousands of kilometers away (Russia, Azerbaijan and even Algeria) with import prices, in the order of ~ 15 Euros / 1,000 cubic feet before tax, and it offers it to the consumer with a household after-tax rate of ~ 30 Euros / 1,000 cubic feet. Egypt will import its Zohr natural gas from merely an 150 km distance, with import prices before tax in the order of ~ 6 Euros/1000 cubic feet, and will offer it to its consumers, with a household after-tax rate, in the order of ~ 10 euros / 1,000 cubic feet. We see therefore, that the Egyptian treasure reserve Zohr, with Greek data in regards to domestic natural gas-prices, exceeds a value of 1.8 trillion euros, that is at least seven times greater than the annual gross national product of Greece, and or Egypt. Based on all the above, with surprise we conclude, that a country like Greece, which in actual fact, lives only through imports, does not plan absolutely anything similar to what Egypt opted for, at the time were we are already aware, that all of the research priorities and identifying patterns and methods regarding the discoveries of hydrocarbon reserves in the Eastern Mediterranean have changed radically. 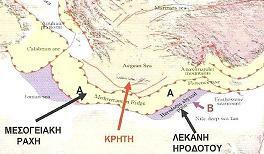 It is about time that the new government becomes alert and to finally attempt to attract investors in a new strategic spirit, as Cyprus and Egypt do so effectively, in the region South of Crete, where major geological target reserves are already emerging, similar to that of the hypergigantic Zohr reserve, and five times over at that.